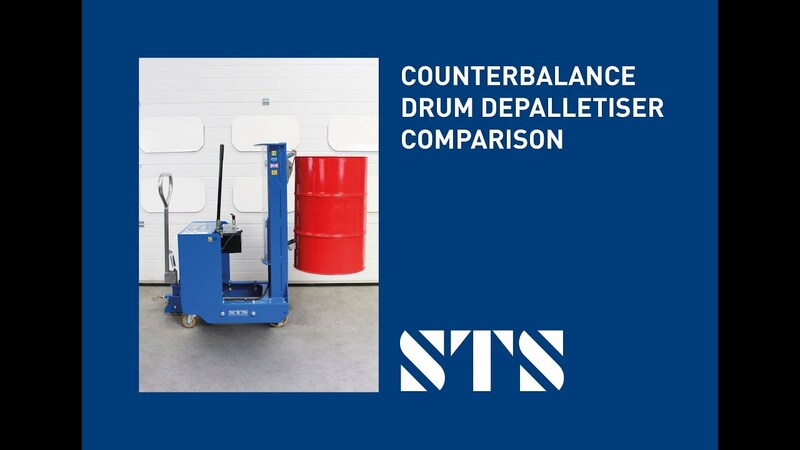 STS counterbalance drum lifters are manufactured in two primary variants, the standard 250kg-SWL model and an extended 350kg-SWL model – this post explains the differences. Most drums used in industry are steel or plastic, 200-22 litres in capacity. Empty, the drums weigh in the region of 10kg +/-3kg depending upon the material and manufacturer’s specification. When operating drum lifting equipment, it is important that the certified maximum load the unit is able to lift is not exceeded. A full 200 litre drum of water weighs approximately 210kg, if the water is changed for honey the drum will weigh approximately 294kg. Before purchasing any drum handling equipment we recommend you review your process to determine the heaviest drums you are likely to need to handle during the lifetime of the equipment. STS counterbalanced drum lifters are suitable for confined areas where alternative wider units (or units with outreaching legs) would not be suitable. The DTP08-250kg model comes as standard certified to 250kg. If you need to lift drums which weigh more than 250kg we can offer the DTP08-350kg; this model is 230mm longer and therefore the counterweight has a greater effect on the load carrying capability; as such drums weighing up to 350kg can be handled with ease. Standard DTP08-250kg drum lifter model handling a red tight-head steel drum.